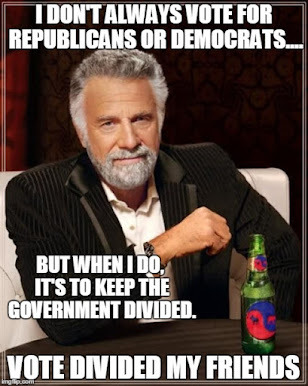 The Dividist Papers: NY Times offers two cheers for divided government. NY Times offers two cheers for divided government. And to be sure, gridlock is in the eye of the beholder. For those whose ox would get gored — for instance, those adamantly opposed to tax increases or to cuts in entitlement benefits — a little stalemate may not seem like a bad thing if it prevents what they consider a worse outcome. One person’s obstructionism is another’s principled opposition." The Dividist is experiencing a bit of cognitive dissonance reading something this spot-on in the Times. The Dividist needs to sit down for a spell. The Dividist does not recall reading anything in the Times casting divided government in quite so favorable a light at any time prior to the 2010 election. You don't suppose the fact that avoiding one party rule in 2010 meant voting Republican and avoiding one party rule in 2012 means voting to re-elect President Obama has anything to do with it - do you? Nah. Certainly not. In any case - the read is well worth consuming one of your 20 free NYT articles in June. The NYT is ALL in favor of demosclerosis when the liberal faction of the D party isn't holding all the reins. I also find it amusing that congressional historian Norman Ornstein is quoted in the article as saying this Congress is the most dysfunctional in history. I quoted him in this blog as saying something similar in 2006, when he was pumping his book "Broken Branch" on Hardball. Coincidentally that was the last time that the GOP controlled the House of Representatives. At that time he seemed to think that divided government was a really good idea rather than letting the Republicans continue holding all the keys. 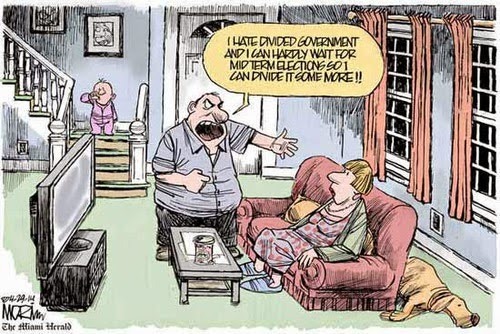 I get the part about divided government being part of the plan. Where I depart the bus is seeing the two factions not getting even close to the "justice and general good" point that Madison had hoped for. They are in for themselves, not for justice or general good. Looks like its time for more division, like a new political party. The old donklephant just ain't what it used to be, if it ever was. "The influence of factious leaders may kindle a flame within their particular States, but will be unable to spread a general conflagration through the other States. A religious sect may degenerate into a political faction in a part of the Confederacy; but the variety of sects dispersed over the entire face of it must secure the national councils against any danger from that source. A rage for paper money, for an abolition of debts, for an equal division of property, or for any other improper or wicked project, will be less apt to pervade the whole body of the Union than a particular member of it; in the same proportion as such a malady is more likely to taint a particular county or district, than an entire State. In the extent and proper structure of the Union, therefore, we behold a republican remedy for the diseases most incident to republican government." The idea was never that "Factions" would be expected to pursue the "justice and general good". The idea was that we get that result when self-interested factions negate each others worst impulses. We are seeing this played out as designed in the debt ceiling/spending cut/tax hike debate. It is ugly, it is fractious, and both sides will play their positions out as strongly as they can right up to the brink. But there will be no default, and we will emerge from the brink with a Centrist compromise that will make no one happy. Except maybe The Dividist, who will be delighted. I do not begrudge you your Centrist Party ambitions. 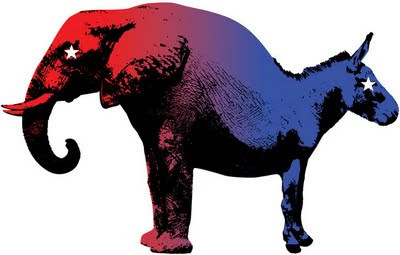 As I've outlined before, I just think your quixotic enterprise is based on two flawed assumptions - 1) That there exists this enlightened Centrist plurality in the electorate (I think there is a huge 80%+ pure partisan majority) - and 2) That a third party can ever function at a national level (certainly at a Presidential election level) as anything other than a spoiler. But - I would be happy to be proven wrong. In the meantime, the Dividist voting heuristic is a way for the sliver of true independent moderates to have a positive impact on the elections that will continue to force a Madisonian "ambition counteracting ambition" Centrist result. I see your points. I did misunderstand. If Madison was right, and maybe he was, I think we are really hosed and irretrievably headed south. If the public really is mostly partisan and that means they are just going to act in their own perceived interest regardless of the public interest, then that too suggests we could be heading south. Maybe what it boils down to is asking whether many special interests all acting in their own self-interest represents a viable way to govern over the long run. My instinct says that's a recipe for failure in the complex, modern world. Based on how I see politics over the last 40 years or so, I believe I can see bad effects of special interest/partisan power. Although I look for it, I just can't see the commensurate countervailing good. Chronic trade deficits. A standard of living fueled by debt and now at risk because the party is over. Heavy dependence on imported energy, whch drains hundreds of billions out of our economy each year (trillions over decades). Incoherent foreign policies and endless expensive wars (more trillions over the long run). Senseless tax (and other) policies riddled with corruption as political payback for "campaign contributions" - hundreds of billions annually. Rotting infrastructure (trillions needed there too). Chronic high unemployment on the horizon. And etc. As for factions negating each other's worst impulses, I am not sure that's how it works these days. When I look carefully at what the two sides do and say, it strikes me that they do not negate most of the bad in each other. Instead, I think they have figured out how to indulge themselves in badness. It is some sort of an unholy, maybe unconscious, compromise. I can't speak for others, but what I see is unacceptable. For at least the past 30-40 years or so I submit that we have mostly (not completely) had politics of self-interest and what has it got us? Is what we now have the best that can be expected? How did we get from essentially having it all at the end of world war II to where we are today. I think that something is broken and needs to be fixed. I know, trying to set up a viable third party is not easy. But, if the best a third party can hope for is spoiler for a couple of election cycles, then fine - I'll take it. How can that be worse than what we have now? If nothing else, it's still constitutional to try.